Three of North Texas' best curators are giving free tours of the shopping mall's significant artworks. Perhaps you’ve heard the semi-serious joke about NorthPark being the best art museum in Dallas, and want to see it proved. Maybe you’ve encountered the shopping mall’s KAWS, or its Frank Stella(s), or its Henry Moore, and want the kind of docent-delivered information you’ll find at actual museums. Or you want to feel a little more cultured to ease the guilt of spending hundreds of dollars in a consumerist frenzy. Whatever your reason, you will have several chances in the next few months to take a free guided tour of NorthPark’s contemporary art collection, each led by one of North Texas’ best curators and art dealers. NorthPark and the Dallas Art Fair, which returns this April, began these tours in September. 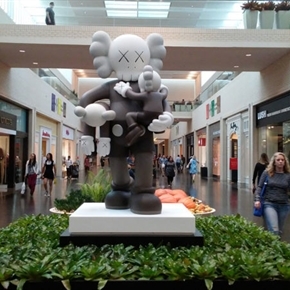 Some of NorthPark’s biggest and most impressive works are hard to miss — Mark di Suvero’s towering red steel sculpture, Ad Astra, comes to mind — and the mall’s concierge desk does offer a map for guests to embark on their own art walk. But a pamphlet won’t offer the same insight or expertise as a knowledgable guide. Each tour begins at 6:30 p.m. and will last about an hour. It’s free, but guests are asked to RSVP ahead of time by emailing brandon.kennedy@dallasartfair.com. Alison Hearst is Assistant Curator at the Modern Art Museum of Fort Worth. Hearst is the curator of the museum’s FOCUS exhibition series and has presented exhibitions of artists including Fred Tomaselli, Joyce Pensato, Thomas Demand, and Lorna Simpson. She is currently working on exhibitions with Stanley Whitney and Katherine Bernhardt for 2017. Hearst also organized Donald Sultan: The Disaster Paintings, which opens at the Modern in February and travels to several other venues. Hearst received a MA in Art History from Texas Christian University and a BFA in Art History from the University of North Texas. Justine Ludwig is the Director of Exhibitions/ Senior Curator at Dallas Contemporary. In recent years she has curated exhibitions at the Contemporary Arts Center in Cincinnati, the Tufts University Art Gallery, and the Museum of Modern Art in Rio de Janeiro. Her research interests include memory, new media, architecture, economics, and the aesthetics of globalization. Ludwig holds an MA in Global Arts from Goldsmiths University of London. After graduating from Smith College, Talley Dunn returned to Dallas and immediately began working with the contemporary art community as an art dealer. For the past seventeen years, Dunn has organized numerous exhibitions at her Tracy Street location and is the founder and owner of Talley Dunn Gallery. Dunn has distinguished herself through an ambitious program of exhibitions and projects both in the United States and abroad, focusing on building lasting relationships with artists, collectors, curators, and critics. Talley Dunn Gallery is a member of the prestigious Art Dealers Association of America, New York.